Have you always dreamed about buying an RV and traveling the country one day? Retirement is the perfect time to do it. You can go wherever you want, see whatever you want to see, and make the most of the retired lifestyle by investing in an RV. 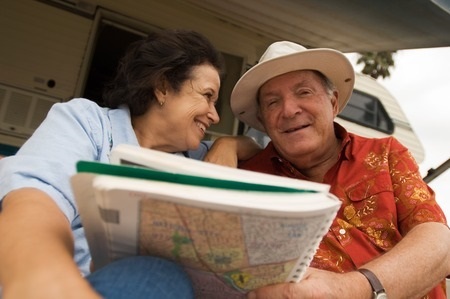 Before you retire to the good life in an RV, there are a few preparations you will need to make. You will need to sell your home and downsize. Not everyone who retires to an RV sells their home. But if you want to take some of your worries off your plate and give yourself the money you’ll need to embrace the RV lifestyle, it’s a good idea to unload your home and a lot of the stuff in it. You obviously won’t be able to bring much on your RV with you, so you should downsize in a major way and get rid of things you won’t need anymore. You will need to find the right RV for your retirement adventures. After you’ve put your house up on the market and sold it, you’ll want to move right into your RV. You should find something comfortable that you and your spouse both like. You should also spend some time learning how to drive your RV and figuring out how to set up shop at different camp sites. Your goal should be to familiarize yourself with the RV lifestyle before you start living it on a regular basis. You will need to furnish your RV. Resist the urge to run out and buy a bunch of stuff for your RV right away. First, live in it for a little bit and see what you really need to have in it. Then, go out and invest in everything that will make the RV feel like home. From blankets and pillows to outdoor furniture and TVs, you can fill your RV with things that make you happy and keep your comfortable. You will need to come up with travel plans. Where are you going to go first in your RV? Where are you going to go after that? And what about after that? The world is your oyster when you have an RV, as you can take it just about anywhere. But that doesn’t mean you should drive around aimlessly. You should always have a plan in place so that you cut down on your fuel costs. It might be a good idea to write down a list of things you want to see in your RV before you start driving around the country. In addition to doing all these things, you also need to take care of your RV once you start driving it. Hemet Valley RV specializes in aluminum and fiberglass RV siding and aluminum RV travel trailer siding. Call us at 951-765-5075 to find out more information about our products and services.